I keep saying that I’m going to blog more, especially since I have a new baby to write about. But finding time to write has been easier said than done because of – you guessed it – the baby! Just as I was submitting grades for my spring term course and thinking that I’d have more time to devote to the blog, BabyM stopped napping. Flat out stopped. And now, finally, after a 2-week nap strike, we’re getting back on track. I’m excited to have time to write again, but I feel woefully behind on all the things I’ve wanted to tell you. Those who have followed this blog for a while know that I wrote a lot about sleep back when Cee was a baby and toddler. 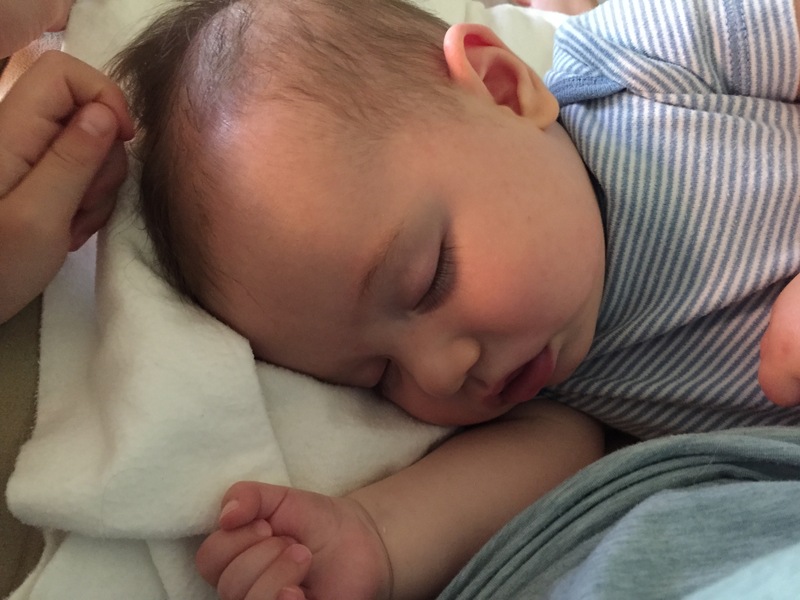 Several readers have written me asking how sleep is going with BabyM and what we’ve done differently this time around, and I hope to write more about the early development of his sleep soon. For now, let’s talk about this nap strike while the memories are still fresh. 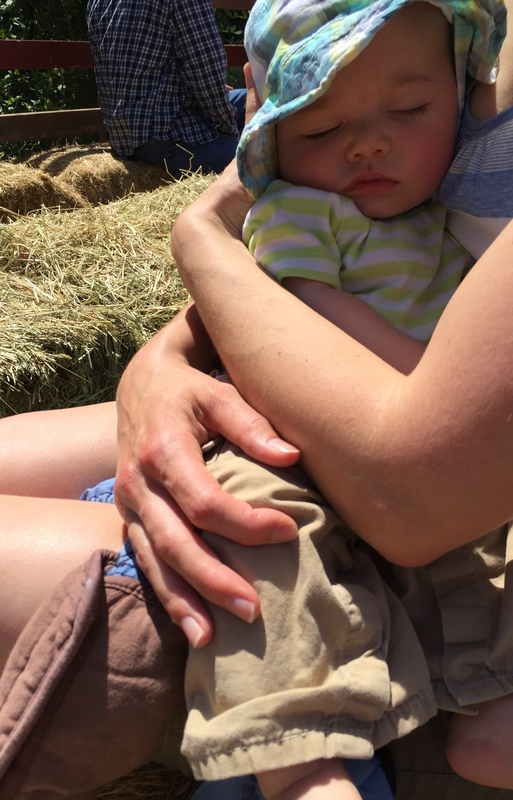 Grabbing a nap in the middle of a hay ride during the nap strike… sleeping, but definitely not in his bed. Since BabyM was about 3 months old, he’s fallen asleep in his own bed for naps and bedtime, usually completely content and without fussing before sleep. (Getting to this point was a gradual and supported process that I’ll write more about later.) As BabyM grew, his naps also grew in length until they organized themselves into 3 naps – one in the morning, one in the early afternoon, and a catnap in the late afternoon – together totaling about 3-4 hours of sleep. That nap routine was blissful. It gave BabyM the rest he needed, and it gave me time to get a little work done or spend one-on-one time with Cee. 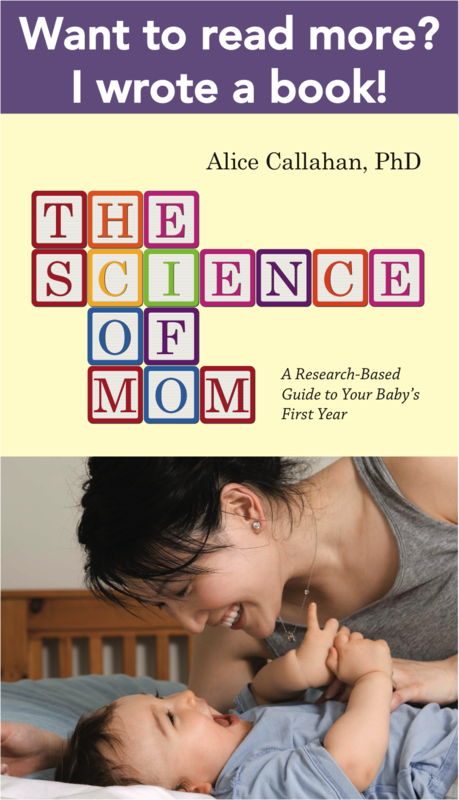 Most of the science on infant napping is focused on the value of naps to a baby’s learning and development. For example, a study published in February found that napping improved 6- and 12-month-old infants’ declarative memory (memory for facts and events) after learning how a puppet worked.1 These authors speculated that perhaps infants need frequent naps so that they can consolidate memories soon after learning new information, as the “temporary” storage in the hippocampus is limited in infants’ brain. Other studies have found that napping helps with learning language.2,3 But really, you probably don’t need science to tell you that napping is important to babies. However, as far as I can tell, there isn’t much research on what factors set babies up for good nap routines or might derail them. Advice about appropriate intervals between naps and transitions in number of naps is really useful, but it seems to be based on experience and everyday observation, not empirical research. And I wasn’t able to find any research on nap strikes or “regressions” to help me understand BabyM’s nap strike. So, lacking much science, I’ll just share my experience and what helped us survive the strike. BabyM’s naps started unraveling when he was around 5.5 months old. It happened gradually at first. He showed signs that he was getting tired, and we’d go through our normal routine. The last part of our routine is standing by his bed to sing a soft song, and he snuggled into my shoulder rubbing his eyes as usual before I put him in his crib. Normally, he drifted off to sleep happily after this routine, maybe grunting a bit and stretching out his limbs before finally falling to sleep. As the nap strike began, everything about our routine was the same, but he just stopped falling to sleep for some naps. I would leave the room and hear him rustling around and talking a bit over the monitor for about 10 minutes. Then he’d start fussing. Usually, he wasn’t crying – just fussing – but absolutely NOT sleeping. At first this happened maybe once out of every 4 naps, then one in 3 naps, then wham! Every nap was like this. I tried letting him fuss with brief periodic checks for reassurance, thinking he just needed some time to wind down. However, this almost never resulted in sleep, even after several nap attempts each day. He was tired, and he would grab catnaps here and there when he could – in the car, in the stroller, in the Ergo carrier. But those naps were never more than about 40 minutes (one sleep cycle), and he never seemed rested when he woke up. What was going on? You’ve probably guessed it already, but BabyM was working on some major developmental achievements. He had been rolling sporadically for a few months, but suddenly he seemed to want to work on it. Maybe he was just realizing that he could use rolling to get somewhere, or maybe he was strong enough to really enjoy the process. During the nap strike, I would finally get my tired, fussy baby out of bed and lay him down on a blanket. He would rub his eyes and then happily get to work with rolling and wiggling around the blanket. He was also suddenly more conversational, making big babbling noises and watching us for responses. Interestingly, BabyM still fell asleep easily and on his own at bedtime, but I suppose that the world was just too exciting for napping during the day. Given the research I mentioned earlier that shows how naps can help babies learn and remember things, it seems ironic that they can have a harder time sleeping during times of lots of learning! Like so much in parenting, it’s always good to hear that a challenge like a nap strike is normal and that it will pass, right? And even though we don’t understand why nap strikes happen, that image of BabyM’s busy brain helped me to be patient with him during the strike. After 2 weeks of nap refusal, BabyM finally came around. It happened suddenly, with his morning nap on his 6-month birthday. He just fell asleep without any fussing or fanfare, as if nothing had ever happened. Since then, he’s been back to napping well and happily most of the time. Halfway through his lullaby, he now arches his back towards his crib, and as soon as I set him down, he rolls right onto his side or his tummy to get comfy for sleep. 1. Be consistent. This wasn’t always easy, but I tried to stick with the sleep routines that had worked previously, even when they didn’t seem to be working at all. I knew BabyM could fall asleep on his own, and it reassured me that he still did it at night. I trusted that he would return to napping well, and I tried to avoid adopting new sleep routines. Instead, I just offered the opportunity to sleep in his bed at least a few times per day. If he continued to fuss, I got him up, gave him some time to play, and then tried again after a while. I think this consistency probably helped him jump back into good naps when he was ready. 2. Be flexible. If you think this sounds like a contradiction to my first tip, you’re sort of right. But BabyM was tired, and I wanted him to get a little rest. So, in addition to nap attempts in his bed, he usually had a few opportunities to rest in the stroller, Ergo carrier, or car seat during the day. Again, these weren’t usually great naps, but they gave him a break, and they allowed Cee and I to get out of the house. I also chose a few naps to nurse BabyM to sleep when we had house guests and our house was chaotic and overstimulating. I didn’t want BabyM to learn that nursing was necessary for sleep, but doing this a few times helped him catch up on sleep. He was back to sleeping on his own a few days later. A sweet nap in my lap, after nursing to sleep. 3. Be patient, and trust your baby. A few days into our nap strike, I was not feeling patient. I’d tried tweaking the nap timing to see if that was the issue, but it made no difference. I started poring over all of my sleep books looking for some magic bullet. I was certain I needed to do something to fix this! It was tempting to think of nap time as a battle of wills, but I can’t recommend this approach. Learn from my story and know that a nap strike can be a normal response to big developmental changes, and it will pass without any great intervention. Stay calm, and trust that your baby will work things out so long as you provide those predictable, familiar ways to nap when he’s ready again. 4. Let your baby grow. In our case, I really think that BabyM couldn’t nap because he was awakening to new possibilities for movement in his world and interaction with the people around him. Whenever I could, I put him down on a blanket so that he could practice rolling, hoping that this would help him work out his current fascination with movement and get better at finding a cozy position to sleep. When he tried out his voice with exuberant babbles, I tried to be responsive and join him in conversation. I don’t know if any of this helped the nap strike pass more quickly, but it was clearly how BabyM wanted to spend his time. And watching him and appreciating this big developmental leap helped me to see the silver lining of the nap strike. Has your baby gone on a nap strike? What did it look like? What helped you cope? 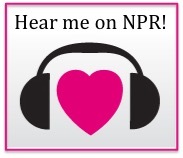 Consider sharing your story here to help parents in the thick of it! Seehagen, S., Konrad, C., Herbert, J. S. & Schneider, S. Timely sleep facilitates declarative memory consolidation in infants. Proc. Natl. Acad. Sci. U. S. A. 112, 1625–1629 (2015). Gomez, R. L., Bootzin, R. R. & Nadel, L. Naps promote abstraction in language-learning infants. Psychol Sci 17, 670–4 (2006). Hupbach, A., Gomez, R. L., Bootzin, R. R. & Nadel, L. Nap-dependent learning in infants. Dev. Sci. 12, 1007–1012 (2009). Oh man, this resonates! My 10 month old daughter has gone on a bedtime strike for the past week and a half. Normally asleep at 7:30, she has suddenly decided that 10:30 is an appropriate time to go down for the night. Luckily her body wants the same number of hours of sleep so, if given the option, she’ll sleep until 9. Unfortunately mamas have to be at work by 8. Trying to be patient and plan evening activities that help wind down, like walks at dusk in the Ergo, extended play time in a warm bath, and quiet music. Getting out and going shopping, visiting friends, or doing a little gardening before it gets dark have helped keep me sane (all with the baby). I have followed you for a couple years now and I have a child that is Cee’s age and now a soon to be 6 month old next week. I am totally going through the nap strikes!!! She naps for 20-30 min and then pops up tired but awake! It use to be 2 hours twice a day with a one hour around 5! And now 6 10-30 min naps a day!! I’m going crazy! But she has started moving around everywhere and getting ready to rock and crawl so here we are at a milestone!!! Keep writing!! Love it!!! Follow My website if You want some news or a like! Thank you! Thanks for this! I’m looking forward to hearing how you got BabyM to fall asleep so beautifully in his own bed. I have a three-month-old and this is one of the things we struggle with for naps (bedtime seems to be pretty consistently easy for him). Isn’t it funny how naps are so much harder for them? I definitely think there is a developmental component to being able to settle easily during the day. I remember the same thing with Cee too. She struggled more with falling asleep for naps and took really short naps until things starting really clicking for her around 5 months, if I remember correctly. BabyM got it a little sooner, but 3-4 months was still definitely a learning period. I think my daughter’s been on a nap strike for about 4 months then! She’s just too interested in the world and usually only naps 40min x 3 per day. The x3 bit is a recent development and feels like a success, prior to this she was nicknamed the napless wonder…. I guess the really tricky thing about nap strikes is that you can’t be sure that your baby is in one until she emerges from it. I was only able to write this post with confidence after BabyM went back to napping. In the middle of it, I wasn’t really sure what was going on! I would assume that a nap strike should only last a few weeks, and longer than that I’d be thinking of other strategies to change things up. This has been my week too! From a short morning and longer afternoon nap to 3 or 4 catnaps my girlie was 6months yesterday so hopefully it will soon pass. I hadn’t really thought about it but her development this week has been phenomenal, thanks for writing about it! Hang in there, Claire! Wishing you good naps! 2 weeks! I’m sure it felt like an eternity. 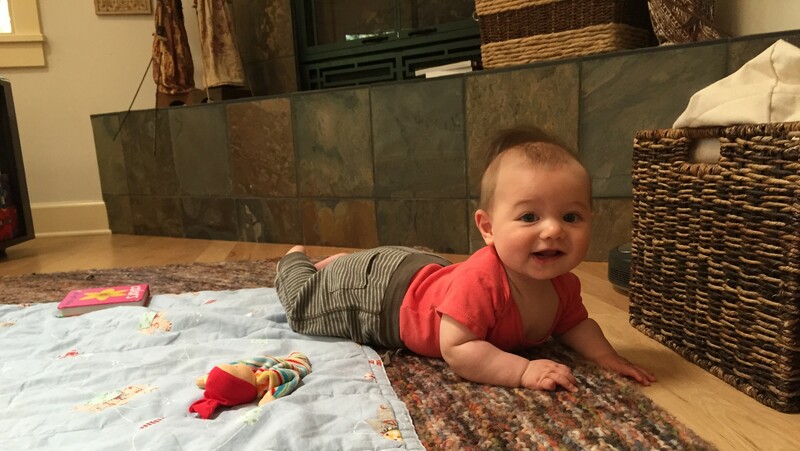 As you say, it’s hard to keep perspective–any perspective at all–when a baby misses naps. My son never went on a nap strike of any length, although naturally there were days when a nap just didn’t take. Of course it seems like those were precisely the days when I was really depending on the nap to so I could write/take a phone call/etc. I wonder if he was just picking up on my anxious energy. I think it’s so great that you got things back on track. I’ve been thinking and writing about sleep for a while (also there’s a very good 3-part series on sleep currently up at “The New Yorker”) and although everyone’s relationship with sleep is different, babies really do need naps even if they don’t always realize it. Overall, I’ve found that the above mentioned mix of consistency, flexibility, and patience helps get us through a lot of these tricky phases. PS. I LOVE BabyM’s hair! Thanks for your comment, MT. 2 weeks DOES feel like an eternity! Cee never went on complete nap strikes either – like your son, she just missed one here or there or maybe went through phases where it was harder for her to fall asleep. BabyM is different. He’s pretty easy going about sleep, but if it’s not happening, then there’s really not much I can do. As always, parenting is humbling! Thanks for the heads up about the sleep articles in The New Yorker. I hadn’t seen them yet and will definitely read them! Thank you for this. My little guy is over whatever that thing was (I guess a nap strike?! ), but it’s so reassuring to know it’s just a thing that happens sometimes. I checked all of my books and I googled, but my good sleeper didn’t need sleep training, he needed to remember that he could do this on his own! That information was NOT helpful. I felt particularly helpless, because I had worked really hard to NOT have him need sleep aids, so that when it came time for me to tell him he needed to sleep, there was nothing I could do that would get him there. There is VERY little advice on the internet about how to provide your baby with sleep cues, all of it’s about taking them away! Please do keep talking about your sleep journey. My little man has been a good sleeper from the beginning, partly because of his personality, but partly because of all the reading I did (including your excellent series on sleep). There is very little information on what’s typical for a child who doesn’t need sleep training. Sounds like our babies are similar in this regard. I also worked hard early on to help him learn to go to sleep on his own. Since it’s usually pretty easy for him to do this, it’s really clear when it’s not happening, and I’ve learned to just trust him and accept that there are some days when he’ll sleep more and some days when he’ll sleep less or need a little more help like with a stroller nap, etc. I feel good about that approach as long as it’s working most of the time to get him the rest he needs. Glad you found my sleep series helpful, and I’ll definitely keep writing about BabyM’s sleep! My 5 momth old is refusing to nap too I’m abt to go insane! He used to be able to nap one 2 hr stretch and 2 cat naps. I have sleep trained him and was getting a good routine at 4 months. Now as soon as he touches the crib it’s game over. He has been working on rolling but I’m akso not sure if his wake time has increased. It’s sooo frustrating! When you took babym out of the crib to play, how lomg did u play for and was babym able to go back to sleep? I’m so half I came across this! I don’t think I have any easy answers for you! When I took BabyM out of the crib after a nap attempt, I tried to let him play quietly for 30-60 min and then tried again. But basically, this didn’t work – I.e. He didn’t fall asleep in his crib – for the whole two weeks. But I kept trying with the assumption that eventually he would be ready to sleep on his own again, and he did. I’m having a harder time telling about his wake times, because he is so engaged and playful most of the time, but we’re shifting from a very predictable 90 min wake time at 5.5 mo to closer to 2 hours or more at 6.5 months. Hope this helps! Thanks for ur response! Just glad to know there is an end to this! I could have written this post myself. Baby Ice is 6.5 months and for the past 10 days naps have been so bizarre, before now, he’s been a champion napper and like you, we worked hard at an early age to encourage him falling asleep on his own, which he does at night. But he’s been having trouble switching off during the day. Very frustrating and praying that the end of this is around the corner… I miss those chunky naps, especially with a 3yo to chase around! I have a 2 month old and I’m dying to know how you taught baby M to sleep on their own! Do share! Thanks so much for this post! I have a nap-striking 10 month old. He just learned to sit from laying down, and just can’t stay laying down during the day. No problem at bedtime – because he’s beyond exhausted! With your encouragement, I’ll relax and celebrate his new milestones and consciousness, and trust that nice chunky naps will return… soon, perhaps? Do you have any advice for a nap strike with a 17-month old? It’s been nine days since she napped in her crib. She’ll nap on me, but in her crib she only screams and screams. She used to nap once a day for 2-3 hours. I do think she’s dealing with some developmental leaps and teething, but it’s such a struggle and it’s hard to believe it’ll end. I’m wondering if I need to make some changes to nap time–push it later (it’s 5-6 hours after wake time), let her have a light-up/sound soother in there (she typically just has two little stuffed animals). Any advice or ideas for this age?